The newsletter from Robot27. It is our mission to provide businesses with the perfect combination of information, resources, products, and training to make their automation dreams a reality. We are a partner with Universal Robots – the World’s #1 collaborative robot manufacturer. In each issue we will feature helpful articles and news to help you learn more about automation and robotics. Also, we’d be happy to answer any questions you may have. Feel free to contact us regarding automating your manufacturing business. We would love to help. Collaborative robots bring efficient and cost effective automation to small- and medium-sized manufacturers. 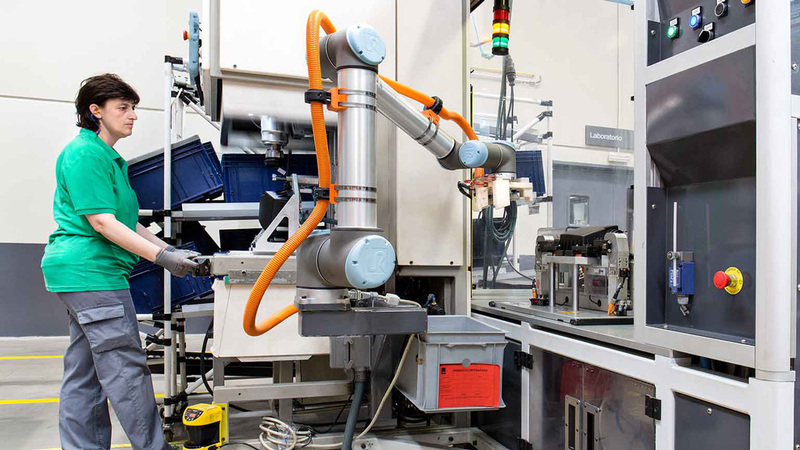 More commonly known as cobots, these machines work right alongside your existing workforce – assisting with repetitive or potentially harmful tasks instead of replacing valuable workers. Many manufacturers see automation as a great way to increase productivity and bottom lines, but are unsure where to get started or where to go from the automation they already have. Cobots offer the best solution to this common problem. Cobots are best suited for tasks that your workers can perform by hand. Most mid-sized cobots have about the same reach and lifting capacity as the average worker. Cobots come in a few different sizes and payload capacities to suit your automation needs. Cobots operate at similar speeds to humans. The gains in productivity predominantly come from the reduction in the amount of time taken between tasks and the increase in time that a cobot is available for work. In many cases, cobots can work around the clock with little to no assistance from a human operator. Of course, there is some variation from task to task. Cobots are ideal for repetitive, manual tasks. While cobots have a large amount of tech onboard, tasks that require critical thinking or analysis, extremely fine dexterity, or problem solving skills are not well suited for automation. There are technologies that allow cobots to perform more advanced inspection or material handling. Once you have a few automation projects under your belt, these kind of projects might be more your speed. What’s next? Are they safe? Once you have decided what you can automate, the next important decision to make is the location of your cobot’s workspace. Cobots are designed to be inherently safe – that is to say that cobots have built in safeguards and safety systems to prevent them from damaging the parts they work with or harming people working around the cobot. These safety systems can be further fortified by connecting additional safety sensors to the cobot. 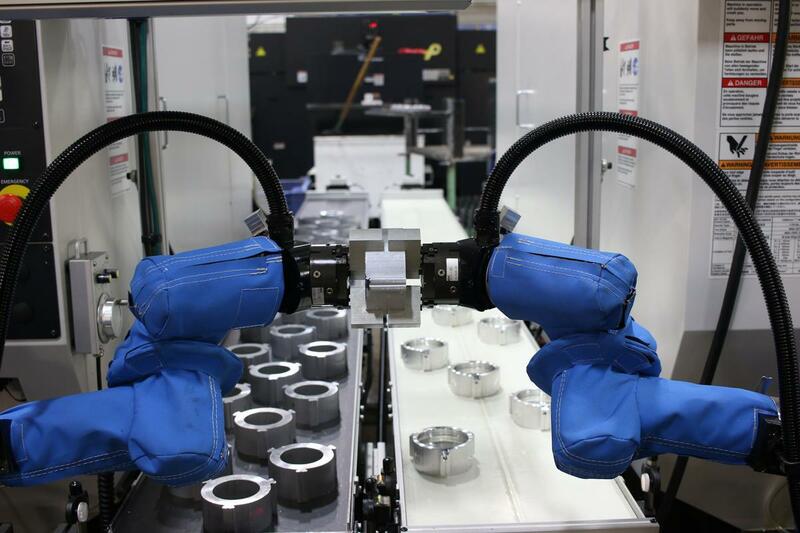 These safeguards allow most cobots to be deployed without a safety cage or complex guarding often associated with traditional large-scale automation. No guarding means a smaller workspace footprint – these machines are not going to take up a large amount of valuable space on your manufacturing floor. The next task to tackle is actually telling the cobot what to do. Programming the cobot might seem to be a daunting task for some manufacturers. The truth is that with a very small amount of training, most factory workers can be trained how to operate and program a cobot in just a few hours. This ease of programming not only allows you to quickly automate tasks, but also makes it easy to redeploy the cobot at various places around your manufacturing floor. Unlike traditional robots, cobots are so easy to program that they can be useful to automate even short run manufacturing projects. Part of the programming process is figuring out what needs to be attached to the end of the cobot arm to allow the cobot to do its work. There are a wide variety of the type of end-of-arm tooling we call “grippers” on the market today. These grippers can be powered by compressed air, vacuum, or electricity and can be used to pick up, move, twist, or otherwise manipulate parts. Many manufacturers use 3D printers to make “fingers” for their grippers or custom attachments for their robots that perfectly suit the task at hand. However, many of the grippers available on the market today can be used right out of the box to pick up and manipulate items. Cobots can be set up to easily communicate with your other machinery, too. From mimicking simple human actions like pressing the start button on a CNC machine to more complex tasks like advancing a conveyor belt to bring parts down an assembly line, the onboard signal and information-processing systems are flexible yet powerful. This connectivity is important since cobots will likely be working alongside at least one other piece of equipment. 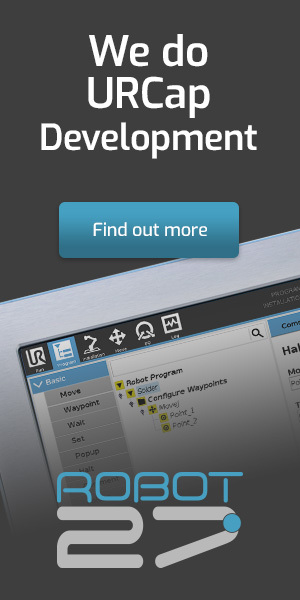 Robot 27 is here to help you learn and make the right choice in automating your manufacturing processes. Feel free to call us or send questions via our contact form. 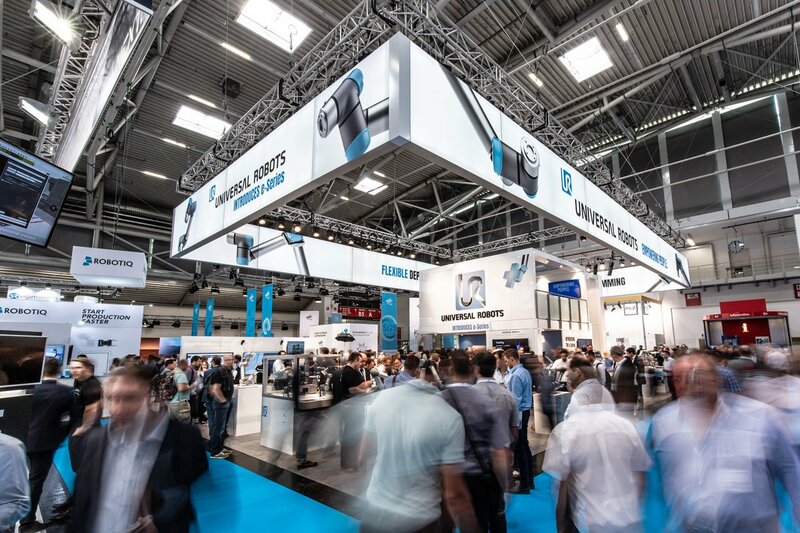 On June 23, 2018, Universal Robots launched the new e-Series family of cobots at the Automatica trade show in Munich – the world’s most comprehensive trade show dedicated to automation. Along with UR’s staple features of rapid deployment, easy programming and setup, and high-tech safety protections, the new e-Series also includes a host of great new features. Integrated force-torque sensors, enhanced and redesigned teach pendant (UR’s programming interface) complete with lighter and easier-to-use cabling and touch controls, and additional input and control ports are just a few of e-Series’ benefits. You can read more about the benefits of e-Series on UR’s website. The Robot27 team has already completed several projects with e-Series cobots and have found them to be a fantastic new piece of machinery. Our experts would love to help. As one of the fastest-growing segments in the automation world, the Robotic Industries Association points out that collaborative robots are getting smarter to stay competitive. Traditionally, heavy industrial tasks have been handled by robots surrounded by safety cages, complex guarding, or other space-wasting items. With recent developments in the collaborative robot field, however, “the line between industrial robot tasks and collaborative robot tasks are beginning to blur” according to an article on their website. For example, Universal Robots have broken into the welding industry with an innovative system called SnapWeld – further detailed in an article on our website. Most automated welding solutions are large, expensive, and require an immense amount of protective guarding to keep them safe around humans. With the recent advances in cobot technology, UR provides a more cost-effective solution for both long- and short-run welding projects without the need for excessive guarding due to the robot’s integrated safety systems. Other industrial applications being tackled by the latest generation of cobots include CNC tending, finished good assembly, and more. 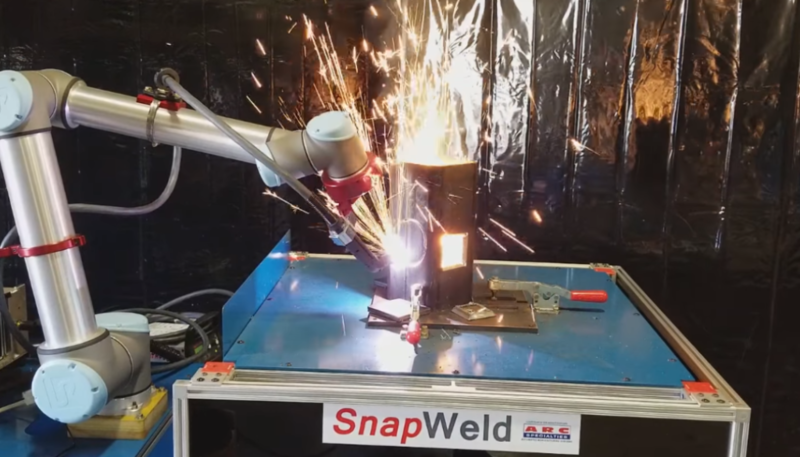 Houston, Texas based ARC Specialties sent waves through the cobot world when it released SnapWeld – the first cobot-ready automated welding solutions on the market. Increasing on the success of that product, ARC now has a plasma-cutter version called SnapCut. SnapCut’s product page notes that the Hypertherm cutting torch is designed to easily cut shapes and paths into three-dimensional structural steel components and other steel components. Just like SnapWeld, only a few points need to be taught to the cobot in order to start your next plasma cut. Flexibility is the big selling point for SnapCut according to The Robot Report’s interview with ARC Vice President John Martin in their article about Fabtech 2018. Martin notes that SnapCut “allows metal fabricators to deploy UR cobots to cut non-standard positions on-location with near plasma table quality.” These specialty cases would normally have to be done by hand on site. As with most manual cutting or torching operations, work by hand opens up greater potential for error through operator mistakes, poor operating conditions, and more. Utilizing a cobot to make these modifications significantly reduces the chance for error while cutting large steel parts. SnapCut is currently under review for addition to Universal Robots’ Universal Robots Plus program – a one-stop marketplace for products certified to work with UR cobots with simple installation and simple operation. From grippers and other end effectors to vision systems and other accessories, UR Plus eliminates the guesswork for both robot owners and systems integrators when designing an automation project. Robot27 uses many UR Plus products in its automation solutions.